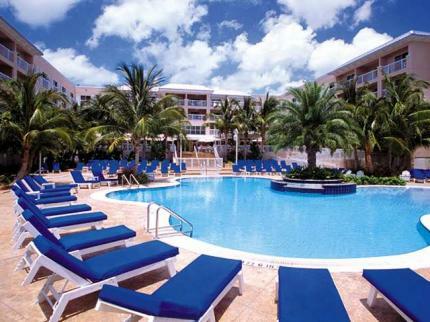 The Doubletree by Hilton Hotel Grand Key Resort can make for an excellent Key West travel base. For starters, this comfortable retreat offers a variety of inviting facilities that can help guests make the most of their stays. Among these facilities is a delightful pool area that features cabana rentals, a waterfall, a hot tub, and ample sunbathing decks. Also found in the pool area is a Tiki Bar, so guests can kick back and enjoy a cool beverage while they soak it all in. At the Doubletree by Hilton Hotel Grand Key Resort, guests are welcomed by a lovely tropical setting, not to mention a friendly staff member who supplies freshly baked chocolate chip cookies. As for settling into the rooms and suites, that shouldn’t be difficult. In addition to a bright and cheery cottage-style decor, each and every guest unit at this Hilton-run property offers an adjustable thermostat, high speed internet access, cable TV, an alarm clock with an MP3 connection, a mini-fridge, a coffee maker, an iron, and more. In the bathrooms, granite-topped vanities, deluxe bath products, and plush towels await. Other highlights at the Doubletree by Hilton Hotel Grand Key Resort in Key West include relaxing massage services, a handy concierge, a lobby aquarium, and a restaurant that serves up Key West specialties. Also available is a convenient shuttle service that can be used to get to famous Duval Street and the airport, among other destinations. There are definitely plenty of great area attractions to take advantage of during a stay at the Doubletree by Hilton Hotel Grand Key Resort. Just one mile away is the beach and a golf course, for example. Other Key West attractions of interest include, but aren’t limited to, the Ernest Hemingway House and Museum, Mallory Square, the Mel Fish Maritime Museum, and the Key West Butterfly & Nature Conservatory.